Phoenix City Hall is located at 200 West Washington Street, Phoenix, AZ 85003; phone: 602-262-6811. Photo: Celora Stoddard/Lon Harmon House, ca. early 20th century, 801 North First Avenue, Phoenix, AZ. Listed on the National Register of Historic Places in 1983. Photographed by User:Kabugenyo (own work), 2012, [cc-by-3.0 (creativecommons.org/licenses/by/3.0)], via Wikimedia Commons, accessed February, 2014. Beginning in 1867, Phoenix was a small supply outpost and trading center in the desert established primarily to service Fort McDowell, a military camp located to the northeast. During the late nineteenth century, Phoenix steadily grew, serving the agricultural needs of the mining towns in the mountains of the Arizona Territory to the east and west. The initial settlers to the area saw great potential in the remains of the prehistoric canal system that irrigated the Salt River Valley. Early boosters and investors began the reconstruction of the canal system in order to take full advantage of the agricultural potential of the area. Over the next twenty years the canals would be realigned and rebuilt to serve a growing amount of acreage in cultivation around the settlement. The Phoenix townsite, planned in a conventional square mile grid layout, was platted in 1876 and legally incorporated in 1881. By 1887, a railroad spur had been extended from Tucson north to Phoenix and, by 1889, Phoenix was designated the Territorial Capital. At the end of the turn of the century, Phoenix was a small but flourishing urban center in the middle of the Salt River Valley. The economy centered upon commercial activity which supported the various agricultural production efforts, primarily cotton and citrus, and businesses involved in the marketing and distribution of crops. Governmental functions were an important part of the town's economy as Phoenix became increasingly influential in Territorial politics. Most of the land in Phoenix at this point in time was controlled by a small number of speculators who intended to sell it for agricultural or residential purposes. The influence of topography on the city's growth was comparatively minor. The initial townsite was located approximately one and one-half miles north of the Salt River at the northern edge of its floodplain. The land south of the townsite was under intense cultivation by the end of the nineteenth century. With the establishment of this agricultural land use to the south of the townsite, the area to the north became the focus for the townsite's development. The only major natural barrier close to the townsite was Cave Creek Wash, which ran southwesterly along what was then the western limit of the town. Any development in this area was subject to the threat of seasonal flooding of Cave Creek which was underscored by two catastrophic floods in 1906 and 1921. This flood potential was an initial factor in focusing development of the townsite to the north. The flooding problem was ultimately resolved by the construction of Cave Creek Dam in 1923, approximately twenty miles to the northeast of Phoenix. The dam became a major factor in the expansion of the city after that time, enabling development to spread to the west side. This influence physically represented by the fact that construction of the west side's historic neighborhoods, such as F.Q. Story (NR), Fairview Place and Del Norte Place, would not begin until after 1923. The first decade of the twentieth century was a critical period for Phoenix. The future of the city depended on securing a reliable water supply for irrigation purposes which would overcome the seasonal fluctuations of the Salt River. Territorial representatives and several of the large landowners were actively pressing the local officials, as well as legislators in Washington D.C., for water control projects in the West. Their success came with passage of the National Reclamation Act of 1902, widely supported by the efforts of the Salt River Valley farmers. The Act established the Reclamation Service and authorized the agency to undertake a variety of water-related projects in the west. Users of the projects were required to form cooperative associations to manage the system and pay for improvements which would be financed by the federal government. By the end of 1902, the Salt River Valley Water Users Association (SRVWUA) had been formed. In 1903, the SRVWUA succeeded in passing legislation authorizing construction of Roosevelt Dam on the Salt River. Completed in 1911, Roosevelt Dam would establish a stable water supply for crop cultivation of the Salt River Valley which stimulated major investments that enabled large scale agricultural development in the Valley. Concurrently, Roosevelt Dam became the cornerstone for the physical growth of Phoenix as the expanding economy attracted businesses and people to the area. The federal commitment to construction of the dam and the anticipated boom in the economy and local population may also have influenced the granting of statehood to Arizona in 1912. The completion of Roosevelt Dam and the granting of statehood launched a period of unprecedented growth in the Salt River Valley. During the first thirty years of the twentieth century, Phoenix would double its population each decade. The demand for land and housing grew accordingly. In 1909, sixteen new subdivisions were opened. By 1912, the original townsite boundaries had been extended to the west towards the state capital and to the north from the downtown along Central Avenue, the main north-south thoroughfare of the community. The northern expansion of the city also followed the streetcar lines as they were extended out from the downtown. Demand for utilities and the other municipal services, which came with annexation, kept the official city boundaries in a state of flux throughout this time. Record levels of building and development were set and surpassed year after year. To meet the increasing demand for housing, a number of individuals and small investment companies began platting the land on the outskirts of Phoenix into subdivisions with housing lots. The standard lot size ranged from 50' x 130' to 60' x 140' in those areas planned for wealthier clientele. Lots in this period were almost always rectangular and oriented along a rectilinear street plan with streets running east to west. This street alignment was largely related to a desire to not face houses directly west into the sun. Instead, the homes built with broad porches could face each other on the street and the porches would be in shade during the afternoon. The pattern that developed with the purchase and construction of homes provides evidence of the importance of the house's orientation in the harsh western sun. As noted, the location of new subdivisions corresponded and paralleled the growth of the streetcar system. From its origins in 1887, the Phoenix Street Railway Company was the main local transportation. In 1892, the system included eight miles of track, connecting the commercial, government and recreational facilities with the in-town residential sections. With the onset of the twentieth century, these lines were extended beyond the city boundaries, providing access and an ability to develop in these areas. One of the earliest extensions outside the city was the construction of a line north from downtown approximately three miles to the Phoenix Indian School. In 1909, a line was installed going northwest to the state fairgrounds. In 1912, an additional line was extended into the northwest area up Second and Fifth Avenues, providing a route to serve many of the emerging early "suburbs." The Brill Line also was extended in 1913, providing a transportation link to the neighborhoods on the east side. Thus, access to the northern areas of the community were firmly established by the streetcar system by the second decade of the twentieth century. The correlation of the location of subdivisions along the streetcar lines was largely due to the financing of the system. Real estate owners and investors, recognizing that the streetcar line would add value to their property, were easily convinced to subscribe to pay the construction costs of extending the rails. Although the specific financing mechanisms changed over time, the importance of the proximity of the streetcar lines to the sale and desirability of the residential developments was proven time and time again. Thus, the streetcar lines, as well as the dominance of Central Avenue as the key business thoroughfare resulted in a pattern of the northerly progression of subdivisions along defined transportation routes which would persist well into the 1930s. The decade of the 1910s saw the formation of land development practices that would shape the form and growth of the community until the Depression years. Fueled by the expectation of major growth, prominent investors began purchasing land parcels ranging from a single block to an entire 640-acre land section. Most subdivision activity was related primarily to the creation of lots which were graded and ready for building, variously provided with utilities and/or street access. Lots were sold off individually to purchasers who would build homes on the lots. Developers of this period limited their investment to platting the land into lots and providing minimal utilities as demand was so high that this was all that was necessary to sell the land. Although competition was keen among the varying subdivisions, the focus of development was in subdividing the land with the actual construction of homes lagging behind the lot development. As World War I approached, most of the land adjacent to the streetcar lines was subdivided and homes were beginning to appear. A number of factors influenced the form and character of this development. Not surprisingly, many early developments attempted to cater to upper income groups, as lot sales and building activity for these homeowners would provide a greater return on the developer's investment. To accomplish this, many early subdivisions had deed restrictions setting a minimum limit for the cost of homes which could be constructed within a subdivision. Deed restrictions excluding racial and ethnic groups also were used to create neighborhoods for certain social and income groups. Due to this practice, new subdivisions in the north part of town were exclusively Anglo. Hispanic and black populations were overtly segregated into the existing buildings found to the south and east of the commercial core. Although the major activity in this period involved the development of basic homesites, there were some attempts at speculative construction and more comprehensive development approaches. Home Builders, Inc., a real estate and construction firm incorporated in 1910 as a branch of the Phoenix Building and Loan Association, was the promoter of Chelsea Place (NR). This addition was first platted in 1907, but never sold. Home Builders replatted the site in 1912 and provided utilities, streets and sidewalks. Chelsea Place even featured entry gates to create an appearance that would entice a wealthier clientele. Working through their agent, the Green and Griffen Real Estate Investment Company, homes were constructed and sold through a financed payment plan. The ability to finance both the house and the lot in Chelsea Place was considered innovative as most development of this period required that a lot be paid for in full and then a separate contract was needed to erect a house. Home Builders also undertook other efforts at speculative housing construction. Working in the western edge of the city, Home Builders erected a number of modest homes in the Oakland neighborhood (NR). These homes were small bungalows targeted for a working class market, with only a minimal outlay required by the investors. Home Builders served as both builder and developer, which was not the prevailing practice at that time. The success of this undertaking encouraged Home Builders to construct speculative houses in various other subdivisions. However, these early speculative efforts remained fairly small in scale until after World War I. The innovative approaches used by Home Builders ultimately would become the model for the development which would ensue in the next decade. The onset of World War I in 1914 had a major effect on the Valley. Population growth slowed dramatically during the war. Fortunately for Phoenix, the adverse effects were offset by an increasing demand for certain agricultural products. Long-staple cotton was essential to the war effort for the manufacturer of tires, balloons and airplane fabric. The Valley was an ideal site for its production due to the climate and plentiful irrigation water from Roosevelt Dam. As manufacturers began to locate in the Valley, new settlements were established and the existing towns grew. Most importantly for Phoenix, the diversification of agricultural production opened new markets for Valley suppliers and expanded the base of the local economy. A number of factors after World War I contributed to the boom that Phoenix experienced throughout the 1920s. Several additional reclamation projects on the Salt River improved irrigation capacity and enabled the expansion of the citrus industry which soon became the major cash crop of the region. Increased production of hay and alfalfa supported the growth of cattle ranches around the state. As the cattle industry grew, the Valley benefitted as an extensive meat-packing industry developed locally. Demand for copper also was high during this time. As mining regions prospered this brought about an increase in the demand for goods and services supplied from Phoenix. This, in turn, fueled the growth of local business. Soon Phoenix had established itself as the agricultural marketing and commercial center of the state. The record levels of agricultural and commercial production of this era resulted in spiralling population growth and corresponding expansion in the physical development of the city. The growth and potential of the Phoenix area did not go unnoticed outside the state. West Coast investors were among the first to be attracted to the community's development potential. Californians brought outside capital to the Valley as they invested heavily in residential land speculation and commercial business ventures. At the same time, tourism was playing a more prominent role in the local economy. Winter visitors from the Midwest, particularly Chicago, began purchasing land and building large estate homes on the periphery of the city. As these varied factors brought money and people to Phoenix, the prosperity was directly manifested in the development of residential subdivisions. Many influences affected the success of the residential developments undertaken in the Twenties. The ability to provide city utilities was one important determinant of the success of these developments. The F. Q. Story neighborhood (NR) provides an example of this influence. The land was acquired by Frances Q. Story and held from 1887 until 1920. Story, a Los Angeles investor and citrus farmer with agricultural interests in the Valley, offered the Story Tract for homesites in 1920. The tract was provided with some gas and electrical service; however, interest in the area was low. After the completion of Cave Creek Dam, the plat was taken over by the Dwight B. Heard Investment Company in 1924. The Heard Company paved the streets and completed installation of city sewer service and gas and electric lines throughout the entire 40-acre development. As the Twenties progressed, the pattern of development continued to expand from simple preparation of lots to include marketing and promotional efforts. The construction of model homes by developers is a good example of these efforts. Model homes were used in a variety of ways. Homes built in particular styles were intended to illustrate the character that was planned for a subdivision. For example, picturesque cottages often were used to create images of "country homes." Spanish Colonial and Mediterranean styles were used to appeal to those interested in a regionally-influenced home. Essentially, through the use of model homes, a potential purchaser could visualize what the neighborhood would look like without the developer needing to invest substantial sums in building street after street of houses. The development of Ashland Place is one of the best examples of the changes in residential subdivision development that occurred in the 1920s. Ashland Place was originally platted in 1920 into 74 lots. By 1924, there were twenty homes under construction or already completed on speculation by its developers, Home Builders, Inc. The first homes featured the designs made popular in the early twentieth century. However, to assist in marketing their properties, Home Builders hired an architect to expand the number of styles that could be offered to prospective purchasers. By being up-to-date and offering stylistically current designs, Home Builders was progressive in the marketing of their development. Their small, but attractive, homes sold well in comparison to many competing developments. As a result, Ashland Place was one of the few subdivisions of the period to sell out almost completely prior to the Depression. By the mid-1920s, the automobile had a prominent role in the city's development. Eventually, it was the automobile that enabled the expansion of the city's limits. However, its initial influence was to support infill development in the central portion of the city. Prior to the widespread use of the automobile, land not adjacent to the streetcar lines went undeveloped as the subdivisions extended out of the city's center along the linear public transportation routes. As the automobile offered greater ease and flexibility in travel, options for the location of subdivisions also became greater. Thus, the advent of the automobile had a major impact on not just the growth of Phoenix but the physical characteristics of how it grew. As the proximity to the streetcar lines, and consequently transportation became less of an influence, other factors related to the provision of services, amenities and marketing became a greater factor in the success of various subdivision development. During this time, the approaches and techniques pioneered by selected builders and developers locally became accepted practices. With the population and economy of Phoenix on the rise, the real estate market was influenced by many new factors. The standard practice of lot sales gave way to the creation of complete development packages. No longer was it sufficient simply to provide a plot of graded land with access to a streetcar line and/or utilities. The city had grown to a point where competition among builders made many options available to consumers. Additionally, residents arriving from other areas, both the East and West Coasts, where community development practices had changed, had greater expectations as to what should be included as part of a residential development. National influences also were coming into play. During this time, the "Garden Cities" philosophies of suburban land use planning were introduced to Phoenix. These factors notably influenced those developments which occurred during the 1927-28 building boom in Phoenix. Reflective of these influences were several new subdivisions, Palmcroft and Del Norte which opened in 1927, and Broadmoor, Encanto, Idylwilde Park, and Cheery Lynn opening in 1928, each with a particular departure from the early patterns of subdivision development. At the upper end of the scale was the Palmcroft Subdivision (NR-Encanto-Palmcroft), which featured a curvilinear street plan with all the streets lined with evenly-spaced California fan palm trees. Reflective of emerging city planning practices, the streets were essentially circular, focusing the circulation to the interior of the subdivision, rather than along the connector street between major avenues. Palmcroft was developed by Dwight B. Heard in partnership with William B. Hartranft, Chairman of the City Planning Commission and director of the City Parks Department. Deed restrictions in the Palmcroft Subdivision required houses built with a minimum cost of $6,500 for lots on the interior streets. This price essentially guaranteed a higher income group. Palmcroft, touted as a "five minute drive from the city," was one of the first subdivisions where the use of the automobile was promoted as the primary mode of access to a new neighborhood. Another aspect of Palmcroft was the construction of model homes in a range of different styles, utilizing the popular Period Revival architectural styles to create a distinctive eclectic character. Del Norte Place was also opened in 1927. Dr. Norton, a prominent local citizen who developed the residential area, had previously planted trees and other landscaping on his land holding to create a distinctive park-like setting. Del Norte was promoted as being "just outside of the city limits." To further support its country-like image, speculative houses in the "English style" were constructed as part of the initial development. Typical of the era, the location outside the city was more than just a promotion. Developing outside the city limits allowed the developer to avoid city taxes and building regulations. When the development began to build up and there was a demand for city services, the developer would petition for annexation. A number of subdivisions which had not been successful during earlier periods were reopened during the 1927-28 building boom. Many featured new marketing efforts or physical changes in the platting and infrastructure improvements. An example of this development practice is Fairview Place which was reopened in 1928. The development had been purchased from the original owners by the Mathiesen Construction Company, who announced plans to construct fifty homes in Fairview Place. The tract offered "graveled streets, city water and lights," although it was still outside of the city limits. Nine speculative houses were built that year and eighteen were built by 1932. Although the project did not succeed to the extent planned, Fairview Place is a good example of the shift toward speculative building, which became commonplace as part of twentieth century residential subdivision development. The development of the Cheery Lynn subdivision also is representative of the changing factors that were utilized to develop and market residential areas in Phoenix during the twentieth century. The neighborhood began as a speculative venture, which included construction of homes, financing for the house, the provision of all utilities and paved streets and sidewalks. William Fosburg, an active local developer, platted Cheery Lynn at some distance from the city on the road to the Biltmore. The thrust of the advertisements for the area was the relationship of the neighborhood to other amenities, rather than accessibility to downtown. Advertisements noted that Cheery Lynn was "only three miles from the city, only 30 minutes by bus from downtown, and within walking distance of the Arizona County Club." Fosburg employed a construction superintendent and constructed fourteen Tudor Revival style homes during 1928. The marketing, and price of the homes, reflected the intent to attract middle-class residents, a rising segment of the Phoenix population. The initial homes were all sold by 1930, indicating that Fosburg had found an appropriate niche in the local real estate market and had successfully packaged the financing, architectural design and subdivision amenities in a manner that appealed to this group. Idylwilde Park also was platted in 1928. It was a notable subdivision because it included a public park on its interior. Each property owner held a proportional ownership interest in this park which featured a swimming pool, gazebo and extensive landscaping. The developers of Idylwilde Park staged an extensive promotional event on opening day sales, which focused on the park and featured "Miss Idylwilde Park." The creation of the park was an effective marketing tool but also was a response to the growing national community development trends of the development of urban parklands. In 1927, the Phoenix Planning Commission required that all new subdivisions include space for parks and playgrounds. Playgrounds and open space requirements also were being promoted by the National Association of Real Estate Boards as a way to enhance property values. In the early twentieth century, some of the earliest subdivisions, located on the east side of the city between Central Avenue and Seventh Street, had been platted into larger lots. Despite their efforts to entice estate-type development on this land, much of this area remained vacant well into the 1920s. Only a few large lot homes were constructed and most of the demand for housing had been filled by the developments with smaller lots. To become competitive, a number of these early subdivisions were replatted. A good example of this shift in the physical form of the subdivision to meet market demand can be found in the historic development of the Los Olivos Subdivision. The initial investors had planned Los Olivos as a neighborhood for the community's elite when the area was first platted in 1909. However, the primary interest in the large parcels was by the small investment companies. For example, Ashland Place was carved out of the northern portion of Los Olivos by Home Builders. The original developers of Los Olivos finally recognized the need to respond to market demand and, in 1928, they replatted the area as Los Olivos Amended and Alvarado Place. The lots in Alvarado were still larger than typically found at that time, but began to approximate the suburban scale found in adjacent developments. The change in lot pattern, with the demand for housing in the late 1920s was an impetus for building in the area and Alvarado saw sixteen custom designed homes constructed between 1928 and 1931. Trends in housing design and building technology during the first five decades of the twentieth century had a profound influence on the character of Phoenix's residential environment. The evolving popularity of stylistic movements during that time are reflected in local architecture and thus provide an illustration of this important historic context. Housing designs in Phoenix followed national or regional trends and concepts, which were influenced by factors such as marketability, convenience to the user, cost of construction, compatibility with deed restrictions and some association with regional vernacular styles. Contemporary trends in southern California played a significant role in influencing the direction of architectural styles and construction methods locally. Other developmental forces related to this concept include the evolution of house form to accommodate the automobile, the invention and development of air conditioning systems, the introduction of new building materials and the standardization of house plans. The evolution of residential architecture in Phoenix is an excellent illustration of these influences. The bungalow style dominated the design of domestic architecture in Arizona from about 1907 through the late 1920s. The vernacular one-story bungalow was an expression of the Craftsman style popularized by two California architects, Charles and Henry Greene. Their designs were influenced by the Arts and Crafts movement and by the intricately detailed wood frame architecture found in the Orient. The style received wide publicity and was quickly spread throughout the country by pattern books and popular magazines. The concept of the Craftsman house - simple form and massing combined with an emphasis on the expression of building materials and well crafted construction details - was easily adaptable to the smaller house. The vernacular bungalow soon became the most popular choice for small home construction in the country. Several factors led to its widespread acceptance as a residential type. The architectural theme of the bungalow lent itself well to simple plan variations, and the emphasis on the use of common materials such as brick and wood, made the houses easy and inexpensive to construct. Some companies even offered precut packages of building components that could be marketed by local lumber companies and builders. Because of its popularity and recognition, the style also was easy to market by subdivision developers. The bungalow also was particularly well suited to the southwest region. Broad verandas and sleeping porches could be integrated easily into the typical bungalow house form. Stylistic characteristics included a simple overall roof form, usually gabled, with the ridge either parallel or perpendicular to the street. Asymmetrical massing was achieved through cross-gabled ells, offset entrances, and dormers. The houses always included a porch, which often was presented as a full or partial width veranda recessed under the main roof. Attached gable roof porches also were common. Porch supports were typically wood columns or masonry piers and often were combinations of both. Aside from the easily recognizable house form, the primary characteristic of the bungalow style was its attention to craftsman detailing, with the level of elaboration being only a function of the size and cost of the dwelling. Craftsmanship design is seen most commonly in the wood elements, particularly the structural components. Broad roof overhangs with exposed rafter tails, ridge beams and purlins, and gable overhangs supported by knee braces were common expressions of the wood structure. In the porch detailing, wood columns, often grouped, supported a combination of beams, purlins, heavy timber cross-bracing and extra stickwork. Timber ends were detailed with beveled, scalloped or other decorative shapes. Windows almost always were double-hung, with multi-pane sash over one-lite sash. The most frequently used designs of the upper sash panes were vertical lite elements, diamond shapes, or Prairie style geometric patterns. Wood casement windows were less commonly used but also were treated with some form of multiple-lite design. Doors were one of the main design features of the style, with the more elaborate examples containing side and top lites. Craftsman doors featured long vertical panels or battens, a single lite in the upper one-third, and some articulation of wood detailing such as dentils at the door's window. In many instances, a French door was used. Wall sheathing was usually limited to four choices: wood clapboard, wood shingles, stucco, and brick masonry. Elaborations in detailing sometimes included a wainscot or skirt below the window sill, pebble dash stucco, and mottled or variegated brick. Foundations were commonly expressed because the design of most bungalows featured raised floor lines and porches. The use of concrete was most frequent, with some earlier examples utilizing concrete masonry units simulating rough cut stone. Bungalows featuring the use of random rock or cobblestone foundations, porch piers and low walls represent a truer expression of the Craftsman style. The Bungalow style was heavily promoted locally by the city's largest organized residential contractor, Home Builders, Inc. From 1910 to 1924, a period when the style was most popular, the company constructed an average of 30 houses per year. Described as a firm that "makes a specialty of building homes for folks of moderate means," the economical bungalow was the preferred choice for the speculative houses built by Home Builders. The success of the company's marketing efforts were chronicled in a 1924 issue of the National Real Estate Journal, which reported that in Phoenix, the California type of bungalow was "the house most in demand at the present time." 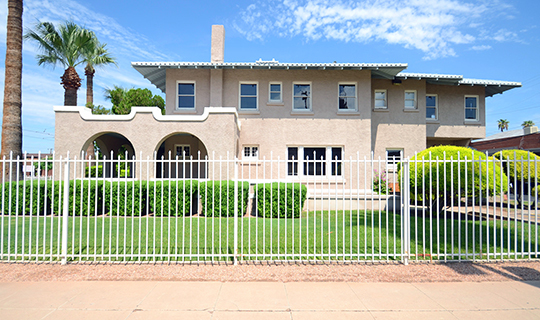 The popularity of the Bungalow style in Phoenix is well illustrated in the historic subdivisions. Almost all of the houses representative of this style were built in the subdivisions that were developed before 1920. However, the majority of Bungalow style houses in the area were actually built between 1920 and 1926, due to the post World War I construction boom. After that period, the style faded in popularity and was replaced by the more fashionable Period Revival styles. The very successfully developed Ashland Place Subdivision includes 25 bungalows along Hoover and Vernon Streets. The Bungalow also is predominant in the eastern portion of the F. Q. Story Historic District. A range of eclectic styles intended to represent picturesque images of Early American, European, or Mediterranean domestic architecture became the popular choice for house designs in Phoenix beginning in the mid-1920s. The local introduction of that array of stylistic treatments, generally classified as Period Revival styles, followed a national trend that began in the second decade of the twentieth century and continued through the 1930s. The stylistic movement emphasized the recollection of eighteenth century American styles, such as the Colonial and Neo-Classical, and also relied on strong references to the vernacular house designs that were suggestive of medieval English and French architecture. During this period, the interest in the revival of the Spanish Colonial architecture of the Southwest expanded to include imagery of the roots of that architecture found in Spain and along the Mediterranean Sea. The Spanish Mission, Mediterranean, and Moorish models evolved as popular designs during the 1920s and 1930s. In Phoenix, some important factors helped influence the surge in the preference for Period Revival styles in residential design. One was that the healthy real estate market and construction boom of the late 1920s coincided with the growing popularity of the Revival styles. In a highly competitive market, new residences built by local subdivision developers required that they not only be modern, but be fashionable as well. The result was that a flood of Period Revival style houses were built in a relatively short period from 1925 to 1930, which in turn increased the community's exposure to the architectural trends. Another influencing factor evolved from a growing sense of regionalism that was beginning to dominate local development trends in the 1920s. Styles that recalled the heritage of the Southwest including its links to Mexico and Spain, as well as the Native American cultures, were the first examples of the Period Revival movement in local architectural history. Spanish Mission eclectic styles and Pueblo Revival modes for house designs were common locally by the mid-1920s. All early twentieth century historic neighborhoods have examples of the influence of regionalism on local building styles. Architect C. Lewis Kelly reported in 1926 that "southern California was leaning to the English type of architecture" and that "the previously in-vogue California Spanish style was on the decline." Kelly had moved to Phoenix in June of 1924 from Hollywood, California where he specialized in house design. In Phoenix, he quickly became associated with Home Builders, Inc. and was responsible for most of their speculative house designs. By 1925, he had designed almost 100 homes built in the Phoenix area. By 1930, he was designing homes exclusively for Home Builders, Inc. and was put in charge of their architectural department. He continued to practice architecture in Phoenix until the 1950s. Kelly's skill as a designer of picturesque Tudor Revival and Spanish Mission houses, together with his association with the most prolific residential contractor of the 1920s, significantly influenced the local popularity and representation of Period Revival styles. Trends in California's residential architecture were another factor that influenced the local construction industry. Phoenix architects and builders had always looked to California for the latest in real estate and building concepts. This was partly due to the need to compete equally with the growing coast cities, and partly as a way to measure successful building and marketing strategies. In addition to the Spanish Eclectic styles that were fashionable in California during that time, styles that were patterned after European vernacular architecture, particularly the English Cottage and French Country Home, also were increasing in popularity. The "English type of home" represented by the Tudor Revival style was the most picturesque of all the eclectic styles. The houses embodied a unique and distinctive appearance that was easy to market in California's growing suburbs. The Tudor Revival style began appearing in Phoenix about 1927. Its advent on the local market was directly related to its success in California. Through the efforts of a few local builders and architects who spent a good deal of time in California studying architectural trends and house designs, the Tudor Revival style was fairly rapidly popularized in Phoenix's residential subdivisions. Most notable are Del Norte Place, Cheery Lynn and Idylwilde Park where the English image was heavily promoted for marketing purposes. The Spanish Eclectic styles that were used for the modest house designs found in the subdivisions developed in the 1920s and 1930s grew from a combination of several interrelated stylistic concepts. The Mission Revival style of the late nineteenth and early twentieth century, followed by a movement to more precisely imitate the Spanish Colonial architecture of the Southwest, were the two most important regional references used by house designers. As the popularity of the Spanish Colonial Revival style grew, architects and builders looked to the roots of the style in Europe for additional inspiration. Designers borrowed elements from a range of vernacular Spanish architecture, eventually drawing from the entire Mediterranean and southern European styles. Decorative detailing or design components from Moorish, Byzantine, and Italian Renaissance architecture often were used. The distinguishing characteristics of the Spanish Colonial Revival style include low-pitched gabled roofs covered with clay tile, asymmetrical massing and stuccoed walls. Flat-roofed variations featured stepped parapets usually decorated with some clay tile. A common house form presented a gabled roof at a portion of the facade, with the remainder of the house under parapeted flat roofs. An additional trait associated with the Spanish styles is some form of arch, usually over a doorway or principal window. In most cases, the element is a round arch, but the Moorish parabolic arch was not uncommon. Extensive porches were not a principal feature of these period revival houses. Instead, small entry porches accessed through round arched openings and covered with gabled or shed roofs were typical. The use of the three-part arch, usually at a gable wall window, was also characteristic of the style. The openings often were accentuated with decorative surrounds, pilasters or spiral columns. Windows used in the house designs were almost always wood casements, usually with four lights per leaf. The Spanish Eclectic styles also made extensive use of French doors, or full length casement windows. They occur at a focal window, as a secondary entry, or as access to a patio. Decorations associated with window elements included wrought iron or turned wood window grilles, and balconets. More elaborate examples were detailed with stone surrounds or scored plaster to simulate quoins, cast stone pilasters or columns, or decorative glazed tile. Doors were a focal point of the typical Spanish Eclectic style house, often displaying the rustic qualities of hand crafted woodwork. A batten door was common and may be detailed with iron strap hinges. Multiple panel wood doors also were used, as were the single leaf French door. Some type of window, usually a small, single lite opening, also was part of the door's composition. Design emphasis of the doorway usually included pilasters, columns, cast stone, or glazed tile. Other design components commonly used were low patio walls at the entry, arcaded walkways usually leading to a side entry or interior courtyard, round or square towers, and arcaded wing walls. The revival of European period domestic building styles was the dominant counterpart to the Spanish-inspired styles of the Eclectic movement during the 1920s and 1930s. Copies of the vernacular architectural traditions of England and France were the most common during the post World War I construction boom. Period Revival buildings that drew from Old World inspired Colonial American housing styles, such as the Dutch Colonial and French Colonial also were utilized during the Eclectic movement. Less extensively seen in suburban housing design during the 1920s were styles derived from French architecture, including the Chateauesque, Beaux Arts, and the vernacular French Cottage. The most exploited of the period fashions was the Tudor Revival style inspired by the English cottages and manor houses of the late medieval period. The Tudor Revival style drew from an extensive palate of materials. Brick, stone and stucco wall surfaces, wood shingle, slate, and metal shingle roofs and wood were combined to provide richly textured images of these romantic period houses. Brick wall cladding was the most common choice of materials, often detailed with brick patterns such as herringbone or diagonal stitching in Flemish bond. The most rustic imagery was achieved by using stone, uncut and laid randomly. Tudor houses were characterized by a steeply pitched roof, ridge parallel to the street, with at least one intersecting gabled ell. The upper gable walls were often decorated with half-timbering infilled with stucco or brick work. Round or pointed arched ventilators typically punctuated the gable heads. Because of the steepness of the Tudor roof, houses often contained half stories in the attic space, with windows in the gable walls or provided by gabled dormers. Artistically, sweeping eaves at facade gables were common and often terminated at an arcaded wing wall. In well designed examples, roof materials used wood shingles laid up in horizontal banding. Some rare examples simulated picturesque thatched roofs using composition shingles that could be built up in irregular patterns and rolled around the eaves. Although rarely used, slate roofs were another stylistic element that lended to the authenticity of the Period English home. The use of extensive porches in the Tudor home was uncommon. Small entry porches, usually offset under an overlapping gable roof, were typical. Some form of round or flattened arch defined the entry porch, with the more elaborate examples detailed with stone or brick surrounds, or scored plaster quoins. In many cases, no entry porch was utilized in the design. Instead, the entry was deeply recessed under the roof, or simple gabled or round arched canopies were used. Doorways were often arched and doors of wood batten, wood veneer or panels were typical. Phoenix has many examples of the range of Period Revival styles popularized by the Eclectic movement. Most were built in the twenties and thirties and are located in the urban center. However, examples can be found in all of the pre-1935 subdivisions, further illustrating the widespread impact of the Eclectic movement on Phoenix's suburban residential development. In the Ashland Place Subdivision east of Central Avenue, three residences exemplify the design qualities of the eclectic residential styles. The houses present a strong visual presence on streetscapes where about half of the homes represent Period Revival architecture. The Bachman Apartment, located at 2320 North 3rd Street, built in 1930 by Home Builders, Inc. and designed by C. Lewis Kelly, is a two-story Spanish Mission style building distinguished by a clay tile gable roof, winding stairway to the second level, wrought iron balconets and liberal use of French doors. Also designed by C. Lewis Kelly is the Home Builders speculative house at 44 East Vernon, a classic example of the Tudor Revival Cottage. Built in 1927, the one and a half story house features a steeply pitched gabled roof with jerkinheads and a curvilinear eave terminating at a low wing wall. Wood casement windows are detailed with either five or nine lights per leaf. Wood shutters and a batten door add to the character of the house. The most impressive collection of large Period Revival houses are located in the Alvarado Historic District. Of these large estate homes, the most dramatic illustration of the effects of the Eclectic movement on local residential architecture is the Carter W. Gibbes House. Listed on the National Register of Historic Places, the house was built in 1930 in what its designer Neil H. Gates termed a "Tudor-Elizabethan" style. Truly an amalgam of elements drawn from the late medieval period with strong Gothic Revival overtones, the house is a richly textured composition that uses brick, stone, cast stone, stucco, and timber wall surfaces. The Gibbes House is a epitome of the picturesque movement in Phoenix and arguably the best local example of "high style" Tudor Revival design. Other examples of Period Revival architecture located in the Alvarado Historic District that were built in the thirties and forties convey a compatible yet distinctive appearance in relationship to the 1920s eclectic houses. The later residences conformed more to the use of modern materials, such as row-lock brick and steel sash windows and also tended to imitate American or European rather than Spanish Period architecture. The movement away from the heavily romanticized Period Revival styles of the 1920s to a more simplified and even uniform reference to period architecture began during the New Deal years. Houses constructed during the 1930s conformed largely to a few standardized house forms manipulated slightly in roof, window and door treatment to convey some period image. This somewhat dramatic shift in domestic architectural design can be attributed to a great extent to the programs of the Federal Housing Administration (FHA). The minimum materials and construction standards required by the FHA for insured mortgages for new construction played an important role in how houses were designed and built. In addition, the FHA openly supported more uniformity in style for new subdivisions in order to enhance future property values. Local builders and developers also saw the advantages to simple choices in the range of house plans and styles as a means to more economically build large scale housing projects. By 1942, much of the moderate size new house construction in Phoenix was being undertaken by builders who were developing small subdivisions with a limited palate of materials, house plans, and stylistic choices. While the builders still referred to the house designs by some name recalling a period style, they also stressed that the homes were of "modern design." The evolution of residential styles to the modern architecture of the Post War boom years has its root in the housing built during the late Depression. Two most commonly used stylistic references for house designs, built locally between 1935 and 1950, were the "Monterey style" and the "French Provincial style." That range of styles representing some period image is broadly referred to as the Minimal Traditional style. The Monterey style house of the 1930s was the precursor to the modern Ranch style house and finds it roots in the "California Rancho" residences exemplified by the Applewhite/Lewis House, 2242 North Alvarado Road. The local interpretation of the style was a simplified version of the Eclectic Monterey style house seen throughout northern California. The two-story houses of that region were typified by a single low-pitched gable roof, sometimes with an offset ell, a second story balcony, often cantilevered, and casement windows almost always articulated with false shutters. In the local, more standardized variations, the Monterey style is recognized by its single story facade presented to the street as a long mass covered with a gabled roof with exposed rafters and often terminating at one end with a cross-gabled ell. A veranda supported by plain or turned wood posts was usually recessed under the principal roof and extended the length of the facade. Doors were offset toward the ell and almost all were paneled or battened. Windows were steel casement discreetly located along the wall and decorated with wood shutters. Shutter design was a common method of achieving the image of southwestern regionalism that the style sought to achieve. A focal window was often included in the design with fixed side and toplites around a simple two leaf casement window. Influence of the modern movement is seen frequently in the use of corner windows. The walls of the modern Monterey style home were almost always constructed of brick, painted white. Brick work typically included a wainscot or skirt below the window sills of tapestry bond while the upper walls were laid in Flemish row-lock. Houses designed in what was termed the "French Provincial style" were based loosely on the French Eclectic house designs of the 1920s. The house form as well as the detailing of this style were much more subtle and reserved than its more picturesque predecessor. Using many of the same floor plans and shapes as the Monterey style house, the French Provincial examples were covered with hipped roofs. The eaves were commonly detailed with cornice molding at the roof-wall junction and had little, if any, overhang. Most examples from the 1930s were asymmetrical in form with interlocking hipped roofs giving the appearance of a rambling farmhouse. Doorways were often offset, facing at right angles to the street. Porches used in the French Provincial style were limited to overhangs or canopies, or were small attached roofs near the intersection of the house's two main wings. More formal variations of the style presented a symmetrical, or nearly so, facade to the street with a central entrance. Elaboration of details recalling the European traditions included raised panel doors, some type of architrave and door surround, such as fluted pilasters. Some designs included broken pediments above the door. Most designs included false shutters, usually louvered. Large chimneys were common elements used to provide added character to the houses. Bay windows also were frequently employed at a street facing wall with parasol type roofs sheathed in metal. The Depression ushered in a range of New Deal housing programs which accelerated the change in development practices in Phoenix and began a new phase in the form and physical growth of residential areas. The diversity of housing styles and interplay of roof forms, wall materials and layouts that characterized early neighborhoods would give way to patterns of uniformity and consistency. As there were many lots still available within the established subdivisions of the central core of the city, the mid-1930s saw the infill of the existing neighborhoods with these new architectural styles, which were prototypical of suburbs to come. Emerging residential areas were laid out and built-up in accordance with government guidelines to promote efficiency, convenience and continuity of planning, design and construction of neighborhoods. The federal government began its active involvement in housing issues in the 1920s, in response to the nationwide housing shortage that occurred after World War I. A select committee of the U.S. Senate was appointed in 1920 to investigate and make recommendations "to stimulate and foster the development of construction work" of all types. The Committee's recommendations did not include direct federal involvement, advising instead that solutions to the housing shortage should come from the private sector. As a result of this study, the first federal agency dealing with housing issues, the Division of Building and Housing, was established in the Department of Commerce. As the twenties progressed, increasing attention was given to the issue of housing shortages and the need for some type of long-term federal housing policy. In 1931, the "Presidents Conference on Home Building and Home Ownership" held by the Hoover administration, set the framework for many of the housing policies that would evolve during the Depression. A key outcome of the conference was the conclusion that the ideal of home ownership should be a national goal of the country. To achieve this goal, a variety of recommendations were made that would have a significant impact on development in Phoenix and the nation. The first was the creation of a long-term amortized mortgage which enabled the cost of a lot and house to spread out over many years. A second proposal that directly influenced local development and construction was the encouragement of large scale residential development to reduce home building costs. The conclusions of the Hoover administration's efforts would serve as key elements of the Roosevelt's New Deal program of the Great Depression. The legislation that introduced and implemented these policies was the National Housing Act of 1934. Enacted during the first 100 days of Roosevelt's administration, the purpose of the Act was to "improve nationwide housing standards, provide employment and stimulate industry, improve conditions with respect to mortgage financing, and realize a greater degree of stability in residential construction." The Act created the Federal Housing Administration (FHA), designed to stimulate new construction through increased mortgage lending by private institutions. To accomplish this, the FHA insured private lenders against risk of loss on new mortgage loans. In return, the FHA required that homes built with FHA insured loans be built to meet certain design and construction standards and the borrower be allowed to repay over a long period with fixed affordable monthly payments. The resurgence of the country's housing industry in the 1930s was a direct result of the FHA program. Nationally, annual housing starts rose from 62,000 in 1934, to 347,000 in 1938. By the outbreak of World War II, almost 4 billion dollars of home construction and improvement had been underwritten by the FHA, representing 500,000 new homes. Building in Phoenix mirrored the national trend as permits, having reached a low of 11 in 1933, increased to 189 by 1936. From January of 1935, when the FHA program was initiated in Arizona, to 1939, the FHA insured 2,100 new construction mortgages representing a value of $8.3 million. Much of this development and construction activity took place in Phoenix. A good example of the effect of the FHA mortgage program can be seen in the building activity in Fairview Place. Originally laid out in the 1920s, the Depression brought construction in the subdivision almost to a standstill. Only six homes were completed between 1932 and 1937. In 1937, however, 28 homes were built, followed by 46 in 1939, 44 in 1940, and 52 in 1941. These four years account for 50% of the construction in the neighborhood, virtually all a result of FHA financing. Another illustration of the impact of this was the development of the Yaple Park subdivision which opened in November of 1937 with eight homes already completed. Mortgage financing through FHA was part of the opening promotional material. A total of 46 homes were built in Yaple Park by July of 1939, representing an investment of over $200,000, all attributable to FHA mortgages. Another concept promoted by the FHA, which influenced residential subdivision development was the encouragement of large scale building operations. Large scale construction was viewed as a way to boost the economy, reduce construction costs and rapidly increase the housing stock. In Phoenix and nationally, the most important change resulting from promotion of mass housing was the shift in the responsibility away from real estate companies to building contractors. Provided with house designs and approval for FHA insured mortgages and resources to secure interim financing for land acquisition and construction, home builders were now able to perform all the necessary tasks of developing subdivisions. The marketing of these subdivisions were assisted by highly visible promotional and advertising campaigns sponsored by the FHA and private lending institutions. Building supply companies also provided financing and promotional efforts to support the contractor's involvement in subdivision development. The development of pattern in Phoenix reflected the national trend toward mass housing development as over 20 new subdivisions were planned and opened within or adjacent to the city between 1937-39. With the success of these subdivisions, this method of home building was established as an accepted practice by the outbreak of World War II. Another important concept promoted by the FHA which influenced the form and appearance of twentieth century building was the notion that streetscapes should present an appearance of uniformity and design continuity. In many ways, this planning concept was a continuation of efforts of the FHA to standardize housing building plans and materials to reduce costs and simplify construction. It also is indicative of the shift which occurred in the role of the developer from land subdivider to the "builder of communities." To maintain FHA support for their development, many Phoenix builders began to construct standardized homes that adhered to the construction and livability requirements of the FHA. Firms such as Home Builders created an architectural department to develop plans that would be stylistically current, yet met the FHA requirements. The first large scale subdivision that fully incorporated the FHA concepts in Phoenix was Womack Heights. It was a single unit developed by building contractors, Porter W. Womack and Andy Womack. The Womacks were among the most prolific of the builders in Phoenix. Initially, they were active in building homes in existing subdivisions such as Del Norte and Fairview Place. However, in July 1939, they created Womack Heights, a subdivision of 52 dwellings costing $250,000. The houses, all constructed on speculation, were completed by February of 1940. FHA approved, these homes all were sold by July of 1941. Womack Heights would provide an important demonstration of the success of mass-produced speculative housing construction. Another subdivision development in Phoenix illustrative of the influence of the planning and design principles promoted by the FHA is the Country Club Park neighborhood. The development opened in 1939 featuring gradually curving streets with an oval-shaped public park as a centerpiece. The use of an innovative, non-linear street layout and uniformity in the placement and appearance of the homes were notable features of County Club Park, which had their origins in the "Recommendations for Successful Housing Development" published by the FHA in 1938. The distinctive layout, platted by the Aetna Investment Corporation, the original developers of the subdivision, was undertaken to enable lot sales approved for FHA financing. The outbreak of World War II would bring construction activity to a virtual standstill. To provide materials for the war effort, all non-essential building activity was halted across the country. Home building in communities was limited to "essential" housing for workers in the war industries. This housing was publicly financed and put under the jurisdiction of four agencies: the War Production Board (WPB), the National Housing Agency (NHA), the Federal Housing Administration (FHA), and the War Manpower Commission (WMC). The NHA was responsible for determining the number of housing units needed in a community given the number of war industry workers at that particular locale. The WPB and WMC calculated the quantity of raw materials and labor that could be spared for residential construction without hindering the country's ability to fight the war. This information was used to set forth the number of housing units that could be constructed each year. As with earlier federal policies on housing, Phoenix's growth and development during the war years is reflective of their influences on building. Due to location of Luke and Williams Air Force Bases, as well as the proximity of manufacturers of war-related products, Phoenix was eligible for the construction of essential housing. Consequently, while building diminished in many other parts of the country, it continued in Phoenix. Subdivisions such as Country Club Park were able to be completed during World War II. The subdivision was not completed, however, by its original developers. Instead, new owners familiar with the complicated procedures associated with the wartime production became involved. The new developers, the Eureka Investment Company, teamed with the local architectural firm of Lescher and Mahoney to ensure that the subsequent building matched earlier homes in the area in accordance with FHA requirements for uniform architectural style. At the end of the war, due to the restrictions of building, Phoenix and communities across the nation faced a housing shortage. Locally, this housing shortage was exacerbated by the fact that many of the air base personnel and servicemen returned to Phoenix as both Luke and Williams air bases remained operational. The population grew as other military personnel, who trained or worked in the area, decided to relocate to the Valley when they returned to civilian life. The passage of the "G.I." Bill of Rights in 1944 would play an important role in addressing the housing shortage faced by the veterans. The original G.I bill provided a guarantee of up to 50% of the loan costs which essentially enabled World II veterans to buy homes with no down payments. With the acceptance of the guarantees by the private lending institutions, Congress increased the guarantee to $4,000 and expanded its operation through the Veteran's Administration (VA). The amount of money made available through the VA was more than sufficient for a veteran to finance construction of a home in almost any Phoenix neighborhood. As a consequence, home construction in Phoenix soared in the five years following the war. Specific examples of the influence can be found throughout the early subdivisions. For example, in Fairview Place, the effect was nearly identical to the boost provided by the FHA program ten years earlier. During the War years of 1942 - 1944, only 36 homes were constructed in Fairview Place due to wartime restrictions. From 1945 to 1950, however, an additional 74 single family homes were built, as well as a number of small multi-family apartments. All of this construction was directly attributable to the financing provided by the G.I. Bill. The building boom associated with the post War prosperity and population growth continued until the end of the 1940s. For the most part, the building activity included infill construction in the established residential subdivisions. Reflective of the changes in the popularity of architectural style and practices promoted by the FHA, this infill building was primarily ranch houses and the more standardized building forms that were being built on the subdivisions at the community's fringe. The resources represented in the "Historic Residential Subdivisions and Architecture in Central Phoenix" are historic residential subdivisions that were platted and developed between 1912 through 1950. Individual homes and apartment buildings may be included if they share thematic or architectural associations with the development of the subdivisions. The districts are part of the historic residential development which borders Phoenix's downtown. The subdivisions were originally part of the suburban development of Phoenix that occurred in the early and mid-twentieth century. The historic subdivisions have both rectilinear and curvilinear streetplan arrangements depending on the date of origin. The residences within the subdivisions are predominantly single family homes. The vast majority are one-story, but are of widely varying sizes and floorplans. Two-story single-family dwellings are prevalent in one of the nominated districts (Alvarado). The exterior facades are overwhelmingly brick or stucco. Roofs are hip and gable in most cases. Flat roofs appear on Spanish Colonial Revival and Monterey style structures. Roofs are sheathed with either wood, asphalt shingles, copper and curved clay tile. The majority of residences have wood double-hung or wood and metal casement sash. Duplexes and isolated multi-family residences are represented in some of the districts. By and large, the residences represent recognized architectural styles generally ranging from Bungalow, Period Revival and their related substyles. Depending on the streetplan, homes occupy standard residential lots and create consistent streetscapes from the applicable architectural period. Lot sizes range from 50' x 130' to 60' x 120' in the modest neighborhoods, to as large as 120' x 130' in the more prominent areas. Setbacks are consistently 20 to 25 feet from the curbline, although placement and orientation of houses may vary slightly in districts with curvilinear streets. The lot size often reflects the spatial relationship pattern of detached garages, porte cocheres and carports. The six districts included in this nomination are identified as meeting National Register criteria A and C. The districts each illustrate aspects of the residential development patterns of the city of Phoenix and the range of architectural styles located in the city. The districts are significant as the manifestations of the city's growth from 1912 through 1950, and the various factors, both local and national, that affected the neighborhoods. These influences are outlined in the three historic context statements presented in the "Residential Architecture and Subdivision Practices in Phoenix" narrative. As explained, the origins, physical form and architectural character of the districts directly correlate with the local economy, national events, trends in residential architecture, and a range of federal programs of the 1930s and 1940s that affected housing and construction throughout the country. To be considered eligible, proposed districts must retain a substantial majority of homes dating from the historic period and enough of the original streetplan to convey the layout of the original subdivision plat. Physical infrastructure such as curbing, street lights and other amenities will ideally be present if they existed originally. Nonconforming properties may exist at the edges of the district, but these will be excluded from the boundaries. Within the districts, the threshold of integrity for contributing properties is defined as the ability of a particular structure to reflect the architectural style and form that the home would have possessed at the time of construction. The main exception is that roofing materials are likely to have been changed, ie. original wood shingle roofs have been almost universally replaced by asphalt shingles. Changes in window materials are acceptable if the proportions of the original opening on the primary facade have been retained. In all cases, the streetscape context of the properties will be largely intact within defined historic district boundaries. District boundaries typically follow the rectangular limits of the original subdivision plates, although vacant parcels or non-contributing and intrusive structures have been excluded along the outside perimeter of the districts. The boundaries follow arterial streets along the perimeters of the subdivision plats. To be included in this nomination, individual residences or other structures must be representative of a prevalent architectural style or pertain to some aspect of the developmental pattern or association with the growth of the particular subdivision where it is located. Individual homes must be located within the boundaries of the original subdivision although they may be separated from the historic district by intrusive land uses. The architectural integrity factors outlined above also apply to individual properties, however, the relationship to adjacent structures is less critical if the overall character of the surrounding neighborhood still retains a discernible consistency of historic setting. The districts included within this nomination are the result of a comprehensive inventory program carried on by the City of Phoenix Historic Preservation Office since the mid-1980s. The Alvarado and Ashland Place districts were identified and documented in a 1989 intensive survey conducted by the City with assistance from a CLG grant. The Cheery Lynn, Fairview Place, Del Norte Place and Country Club Park districts are the culmination of a City-sponsored survey program through which neighborhood residents are trained in survey and research methods. In all cases, architectural and stylistic data was collected through intensive surveys of each home in the neighborhoods. Inventory forms were completed and photographs taken to account for all properties within each neighborhood. All data was reviewed by the staff of the Historic Preservation Office (HPO) and the State Historic Preservation Office. The HPO staff also made final judgments concerning boundaries and integrity based on the criteria cited above, and in consultation with SHPO staff as necessary. Stylistic identification was based on the publication Historic Homes of Phoenix: An Architectural and Preservation Guide published by the City HPO in 1993. Historic information was derived from archival sources, city directories and newspaper documentation. In the unique circumstance of Phoenix, all of the original subdivision plats are on file, providing primary documentation concerning the dates of the subdivision plats and the street layout. Also, the local newspaper, the Arizona Republic reported extensively on the development of neighborhoods and architecture in general. This is supplemented by the extensive promotional advertising contained in the papers particularly during the economic boom of the 1920's. The neighborhood participation aspect of the City's survey program has resulted in widespread interest and understanding of the historical development of the neighborhoods. Each of the six neighborhoods are designated on the Phoenix Historic Property Register, Three additional neighborhoods are actively involved in the survey process and are seeking designation. Deborah Edge Abele, Roger Brevoort, Bill Jacobson, Vicki Vanhoy; City of Phoenix Historic Preservation Office, Historic Residential Subdivisions and Architecture in Central Phoenix, 1912-1950, nomination document, National Park Service, National Register of Historic Places, Washington, D.C.